This is going to sound strange, but upon our evening arrival to the mountain town of San Cristobal de las Casas, all I could think about was my doctor’s receptionist. I had been in for a check-up my last day at home before leaving for Mexico, and somehow in-between heading into the exam room and returning to the waiting area the entire office had learned about my impending journey (thanks Mom). As I headed for the door the receptionist called out to me in her shrill, thickly accented New Jersey drawl. “Why wouldn’t I?” I answered, with a particularly tense smile. This wasn’t the first time someone had asked me this question. If you’re watching the news these days the media portrayal of this country isn’t exactly all margaritas and roses. I’ve heard all sorts of reasons why I shouldn’t come here. It’s dirty, they told me, and what about the drug war? I tried to be patient with these types of comments, but in so many cases the words came from a place of such overwhelming ignorance I simply didn’t have the stamina to explain myself. So the ‘why wouldn’t I?’ that I shot at the receptionist that morning was a well-practiced put off to a conversation I simply didn’t care to have. As I walked the pristine, lamp-lit streets of San Cristobal that evening, I thought of all the negative comments that had been made, of all those ignorant people sitting now in their strip malls back in the US, feeling safe in a cloud of car exhaust and florescent lights. If I were to show any of these people a picture of my view now, they would never have guessed I was in Mexico. I felt sorry for them. Waking up the next morning I was delighted to discover what had been veiled by darkness the night before: mountains, all around us. Not Colorado-style mountains with rocky peaks and granite outcrops, but gentle, rolling, lovely green mountains. The town cemented itself at the base of a sturdy mountain valley, and then spilled out and up the sharp hills. 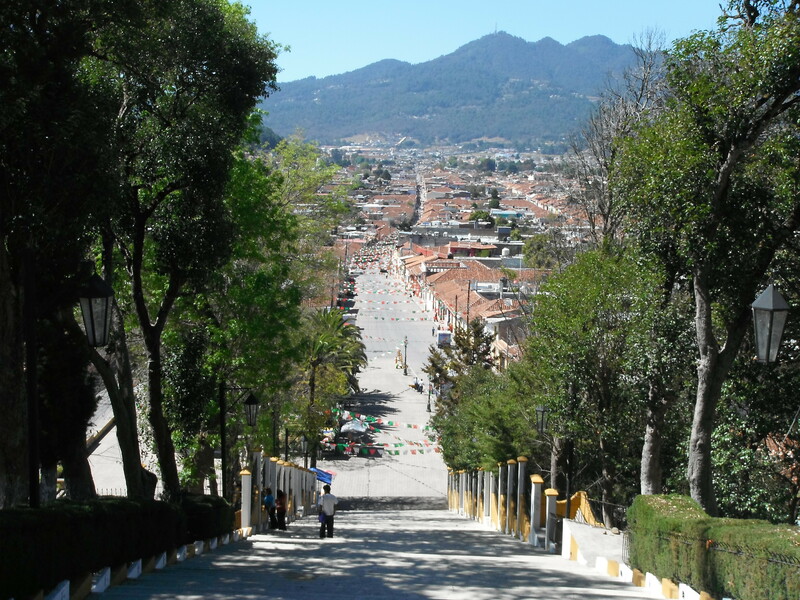 Founded in 1528 by Diego de Mazariegos, San Cristobal is one of the few colonial cities in Mexico not built on top of an existing pre-Hispanic settlement (aka, an indigenous community wasn’t ransacked and razed for the sake of Spanish expansion). 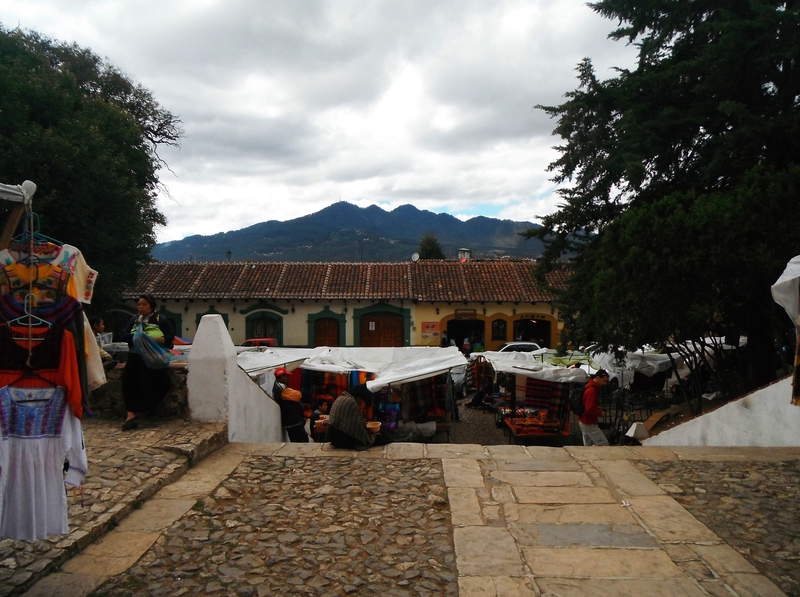 Even so, there is a major indigenous presence in this area, resulting in colorful crafts, bustling markets, and a very interesting political history (San Cristobal sits at the heart of Zapatista territory, but more on that later). A and I spent several days exploring the cobblestoned streets of this lovely town, which includes several museums and many breathtaking churches – two of which are perched on opposite, steep embankments with breathtaking views of the city, if you’re up for a hike. A and I were so up for a hike that we climbed both back-to-back, though not without a lot of panting and well-deserved sweat. The cool breeze that accompanied the panoramic views was a welcome prize. But I’d be doing San Cristobal a disservice by rambling on and on about its beautiful buildings and mountain setting. Although this is without a doubt the loveliest town we’ve visited so far, it was the food that highlighted this stay for me. San Cristobal is becoming quite the cosmopolitan place, with many international cuisines represented on its sweet straight streets. During our time exploring, A and I sampled delicious French pastries, savory Italian pizzas, awesome American-style burgers, and an Argentinian steak to die for. But it was the regional specialties that hooked us. 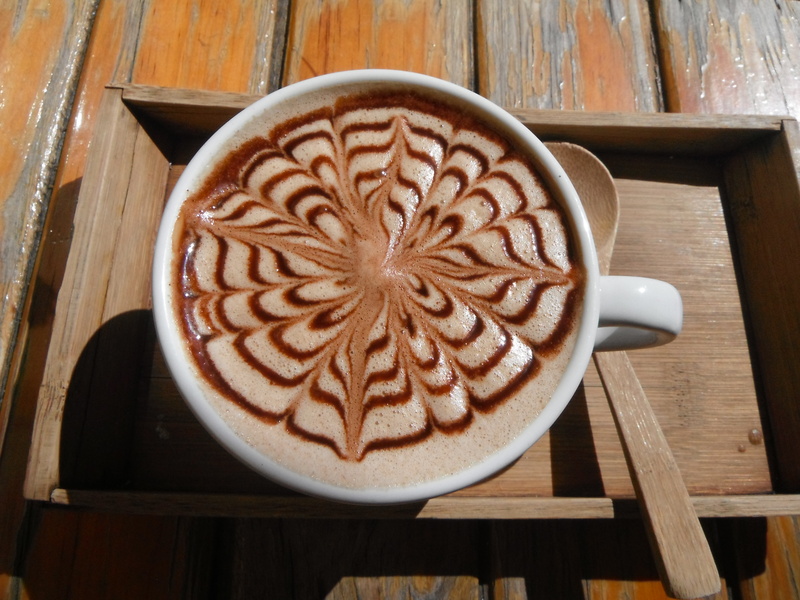 In particular, the mountains in the area are well-known for their coffee and chocolate. Unfortunately for me, I have a caffeine allergy that requires me to steer clear of coffee, though Austin enjoyed samples several times a day and spoke very highly of his caffeinated experience. But with a little bit of self-control I can enjoy chocolate, and boy did I ever. San Cristobal in January is the perfect setting to enjoy a frothy chocolate caliente. Although it doesn’t snow, it is quite cool in the mornings and the evenings, and nothing really warms your toes like melty chocolate from the hills above. 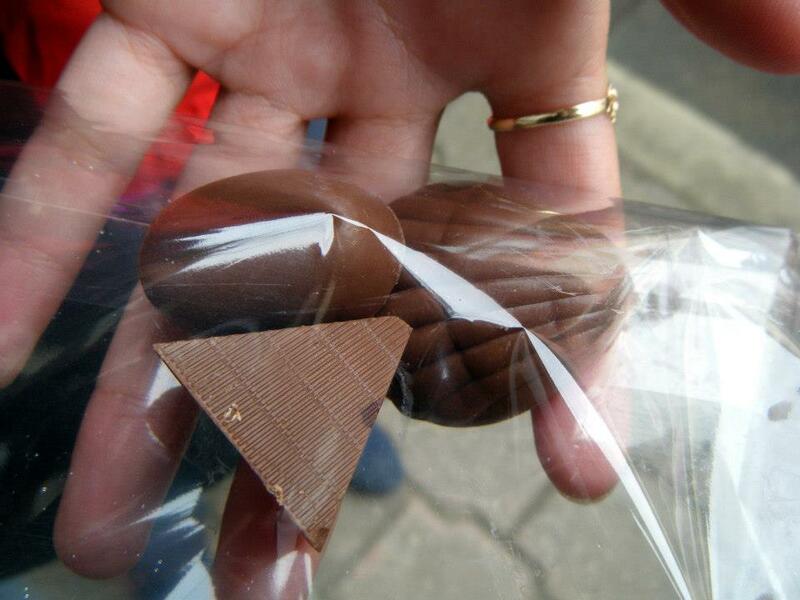 There are chocolaterias on almost every street that will not only happily prepare you a hot cocoa, but also have a large choice of fresh, hand-made chocolate on site so affordable, A and I found ourselves stopping in several times a day to pick out a few dark concoctions. My favorite was a mezcal-infused truffle. So good! Though we already knew San Cristobal was a foodie paradise, and expected to find good coffee and chocolate, there was one discovery that I did not expect to stumble upon. 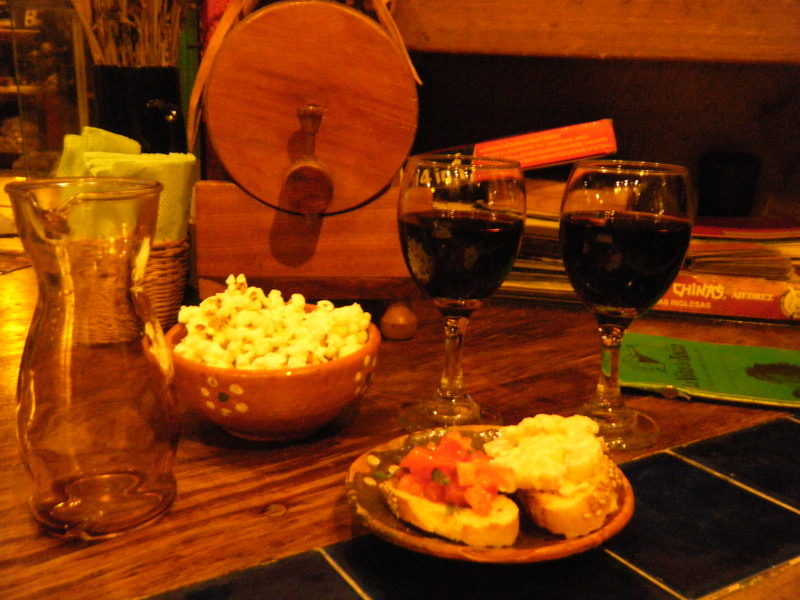 It was in San Cristobal that we discovered an emerging Mexican wine culture. Alcoholic beverages and Mexico very often go hand-in-hand. Home of tequila, mezcal, some of the most popular beers in the world, and of course margaritas, you’ll find your fill of boozy substances to take the edge off whatever ails you. But not many people pair Mexico and wine. In fact, our guidebook explained that wine, since it is mostly imported, is really only a drink available to the Mexican upper-class, and that if you order it at a restaurant, not to expect your waiter to know anything about it. But entrepreneurs around the country are starting to change that, and San Cristobal, though not located in a wine-producing region, is whole-heartedly embracing this new Mexican trend. I’ve counted at least 3 wine bars on the street where we’ve been staying, and if you think about it, that makes sense. Margaritas and beers are great to cool you off, but what if you need to warm up? My experience with Colorado winters has taught me that nothing heats you on a chilly winters’ night quite like a glass of musky red wine. 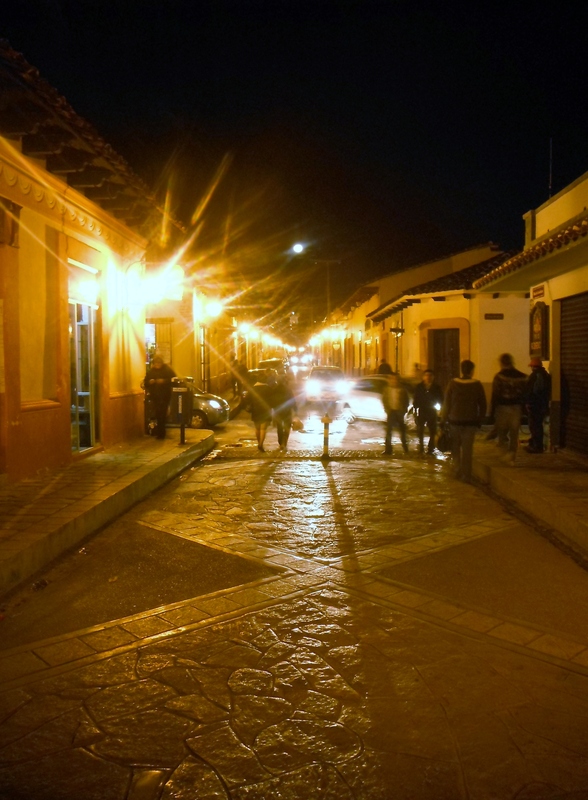 We headed to La Vina de Bacco on our first night in San Cristobal, and loved it so much we ended up stopping in every night of our stay. Although this cozy wine bar offers an array of international options, they’ve also got a good selection of Mexican wines that start at M$18 a glass (That’s less than US$2 people!). And, much in the vein of my botana experience in Campeche, each round comes with a plate of simple but delicious tapitas. A and I made many cheap meals out of this fantastic place. 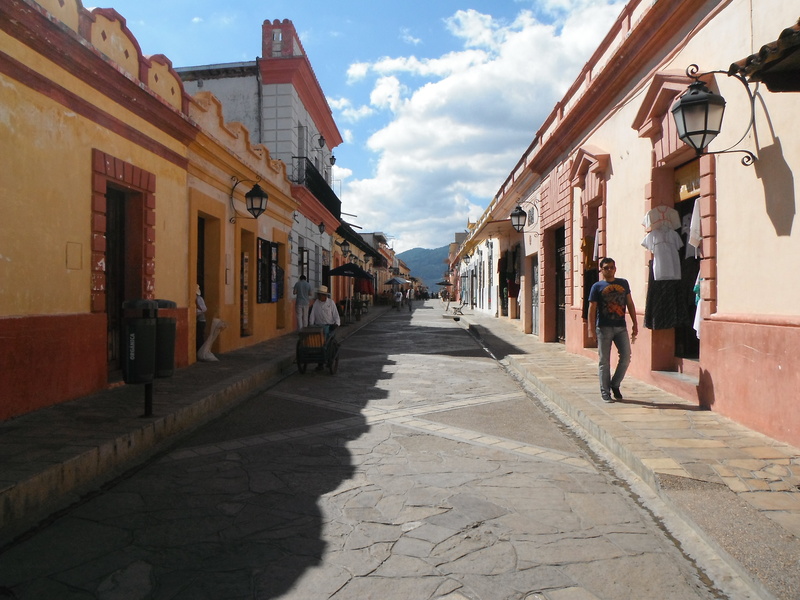 I came to San Cristobal de las Casas to explore a rich history, beautiful mountains, and gorgeous colonial streets. 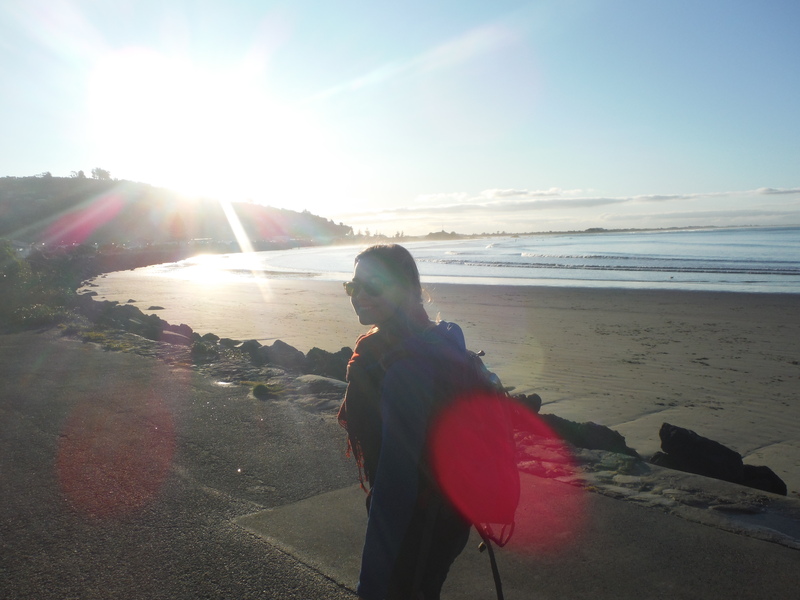 But it was thanks to the warm chocolate and good wine in this cool-climate town that I decided to stay. Sounds like San Cristobal is a little gem! IT LOOKS LIKE A GOOD PLACE TO BE!. I AM VERY HAPPY TO SEE ALL THE WONDERS THAT YOU GUYS ARE DISCOVERING AND NEVER EVER STOP WRITING THE CRONICS OF NANA!